I recently led a team excavating at one of the most iconic archaeological locations in Southeast Asia, Niah Caves in Malaysia. Over a period of three weeks, we dug through what we believe to be around 20,000 years of human history. We uncovered several human bones, the remains of large mammals (probably deer and wild cattle) and marine oyster shells indicating a period of seafood meals. Stone tools and charred rocks were also unearthed. It was exciting and a little bit daunting to be digging at Niah Caves, given its place in both the history of archaeology and more broadly of humankind. Niah Caves National Park is located in the eastern part of Sarawak, a state of Malaysia that hugs the northern coastal strip of the island of Borneo. Borneo straddles the equator, and is covered mostly by dense tropical rainforest. It's home to a remarkable variety of wildlife, including the endangered orangutan. Sarawak also has a rich cultural heritage with almost 40 indigenous linguistic or cultural groups living there. It is an island that was famous until the 1970s for its head hunters. It's also the place where Alfred Wallace, credited by history as the discoverer of evolution by means of natural selection, developed his ideas during the nineteenth century. Daily Dig Diary Day 21: ancient human bones, tools and oyster shells were found at various depths. All diary postings can be seen at https://www.facebook.com/curnoeanthropologist/. Sarawak also has an extraordinary history of human occupation. This stretches back at least 46,000 years ago, soon after the earliest modern humans settled the region after they made their long journey out of Africa. Borneo is the island where these early people began island hopping across Southeast Asia and eventually settling New Guinea and Australia, making it crucial also to understanding ancient human history across the Australasian region. The massive Niah Caves complex sits within a large limestone hill in the centre of the national park. There are 21 caves in the main cave network with six large entrances or cave mouths. The largest cave is the West Mouth (Lobang Kualar) which is more than 60 metres high in parts. The chambers of Niah Caves reverberate with the sounds of bats and birds known as swiftlets, which seem to fill almost every nook and cranny they have to offer. The swiftlets make highly sought after bird nests, used for traditional Chinese medicine and to make bird's nest soup. These nests are collected and traded each day by local Punan men, who scale tens of metres into the highest ceilings of the cave climbing wooden poles without safety harnesses, risking their lives in the process. Daily Dig Diary Day 16: bamboo structures allow local men to collect birds nests from the caves. All diary postings can be seen at https://www.facebook.com/curnoeanthropologist/. The potential of Niah Caves for informing scientific understanding of human origins was first recognised during the nineteenth century, when Wallace alerted Thomas Henry Huxley – "Darwin's bulldog" – to them. Huxley organised the first European expedition to Niah Caves, led by Alfred Hart Everett in 1878-79, but he returned to England with little to show for his efforts. The caves had to wait almost 100 years before the first archaeological digs were done, led by Tom Harrisson from 1954, and joined soon after by his partner Barbara Harrisson. Their excavations ran for 13 years until 1967, digging in several of the caves in the Niah Caves complex and adjacent areas. Their largest haul was found in the West Mouth, where in 1958 they unearthed the so-called "Deep Skull". This was a partial skull, and accompanying leg bones from an individual today known to be about 35,000 years old. The Harrissons found a total of 270 sets of human skeletons in the West Mouth, but unlike Deep Skull most of them are from an early farming or Neolithic cemetery, dated between about 2,000 and 4,000 years old. Daily Dig Diary Day 20: cremated bones in a Neolithic cemetery. All diary postings can be seen at https://www.facebook.com/curnoeanthropologist/. Three other teams of archaeologists have worked at Niah Caves since the Harrisons. 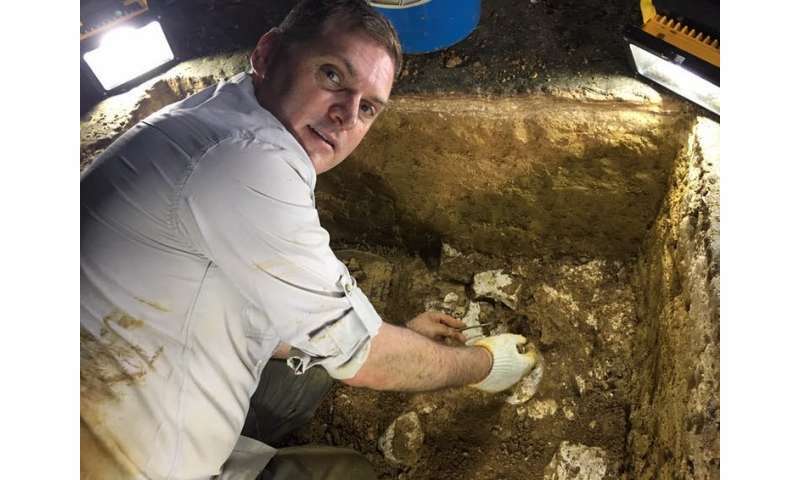 The first was from Malaysia, and dug in the West Mouth in the 1970s – the scientists found an Iron Age cemetery, dating between about 500 and 2,000 years old. The second group, also from Malaysia, excavated a small area of an adjacent cave called Painted Cave and found yet more Iron Age cemeteries. This cave had also been dug earlier by the Harrissons, where they found numerous boat-shaped coffins and described dozens of paintings adorning the walls of the cave. The final team was from Cambridge University and focused on reassessing the earlier work of the Harrissons. Among other things they provided a detailed framework for determining the age of the archaeological finds of the Harrissons using modern geological techniques. Daily Dig Diary Day 12: boat coffins in Painted Cave. All diary postings can be seen at https://www.facebook.com/curnoeanthropologist/. After six years of planning the project with colleagues at the Sarawak Museum Department, on the twentieth of November 2017 we began the next phase of archaeological research at Niah Caves. It was the fiftieth anniversary of the end of the Harrisson's excavations, and also the year of my fiftieth birthday. We chose to dig at a site called Traders cave, which sits outside of the Great Cave complex. We had surveyed it numerous times and had always been struck by its potential. Traders Cave is 190 metres long, about 30 metres wide and up to 15 metres high. The Harrissons dug a small pit at the entrance to it back in 1956 but found nothing of note and gave up, focusing instead on the West Mouth. My team included people from from Australia, Malaysia and Sri Lanka, involving archaeologists, heritage specialists and student volunteers. Across the three weeks, we dug two squares in the middle of the cave, about 20 metres apart. Each one measured one metre by one metre, and we dug each layer in small units or "spits" of five centimetres. In the first one we dug through two metres of sediment before we stopped, to continue the work next year. In the second square, we reached a depth of 1.8 metres before we hit the limestone floor of the cave and could dig no further. So, what did we find? In the first square, we found several human bones including fragments of skulls and part of a leg bone, across different layers. We also recovered the remains of large mammals, probably deer and wild cattle, and a whole layer of large marine oyster shells that were brought into the cave by people and probably consumed there. A number of stone tools and rocks that seemed to have been burned in fires made in the cave were also unearthed. The second square was not nearly as rich but it did provide us with a collection of stone tools stretching across much of its nearly two metre depth. At the moment, all of the evidence we have points to us having dug through Palaeolithic layers. Based on comparisons with the objects found by the Harrissons in the Great Cave complex, we think the Traders Cave deposits are mostly 20,000 years old or more. Daily Dig Diary Day 8: sorting through the findings from one of the pits. All diary postings can be seen at https://www.facebook.com/curnoeanthropologist/..
Next year we'll return to dig again for at least two weeks. We plan to focus on the first square, the richest one: we'll dig until we reach the cave floor, and also open the square up, enlarging it to search for more human and animal bones and stone tools. 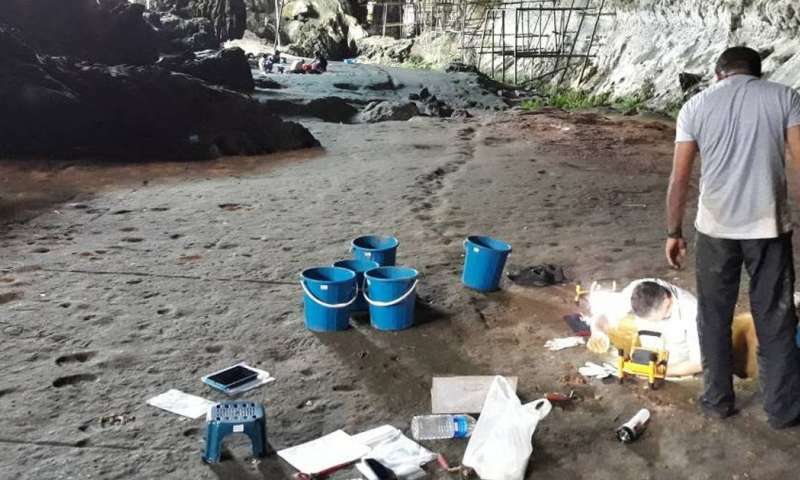 A major focus of our work will also be to determine the age of the finds and the sediments at Traders Cave, using as many different techniques as we can so we can be confident of their true age. Hopefully samples from these excavations are tested for DNA fragments and we will be able to tell if the caves were inhabited by related groups or varying ones over the years.